This entry was posted in Uncategorized and tagged 80th nniversary, Australia, ChronicleChamber.com, Dudley Hogarth, Frew Publications, Glenn Ford, The Phantom by kevpat. Bookmark the permalink. With at least a few countries publishing their own original Phantom stories…is it time for Australian-produced Phantom stories at long last? Hi George, thanks for your comment. Forgive me if we’ve already addressed this topic elsewhere on Phantom-related Facebook pages, but, yes, I daresay you’re not alone among Australian “phans” who would like to see new, Australian-produced Phantom stories published by Frew Publications. The key determinants here are, I suspect, legal and commercial ones. Egmont (Sweden) apparently holds the exclusive worldwide licence for producing new Fantomen/Phantom stories for publication in comic magazines, throughout Scandinavia and elsewhere. 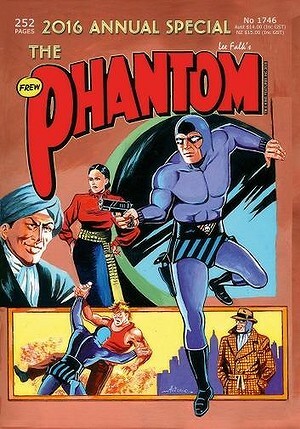 We can only speculate as to whether the new co-owners of Frew Publications have renegotiated the licensing agreement with King Features Syndicate (which owns all copyrights & trademarks for The Phantom franchise), which allows Frew Publications some scope to commission and publish Australian-drawn stories for the local market. Then there is the considerable upfront cost involved with commissioning work by Australian writers and artists. While the late Jim Shepherd claimed that the Australian-drawn stories he produced in collaboration with artist Keith Chatto proved enormously popular with Australian audiences, I don’t believe these stories were syndicated to overseas markets – and that was perhaps the only way that Frew Publications could have at least recouped their upfront production costs, and feasibly made a profit from them, by syndicating them to foreign markets. But given their strong Australian-focus, it seemed unlikely that Semic Press (later Egmont) in Sweden would have been especially interested in running these stories in the Swedish edition of Fantomen (Also, the Shepherd/Chatto stories were always intended to be published in black & white format, whereas Fantomen had by the early 1990s reverted to full-colour printing, which would have made it difficult to reproduce Chatto’s densely-drawn stories in full colour). I think that we will have to wait and see what surprises Frew’s new owners have in store for Australian audiences.